Before you can start planning your wedding day, you should take the time to find out about the necessary Islamic requirements needed to conduct the wedding. This article will provide some information on the necessary Islamic requirements for a Muslim wedding. The marriage is called a "Nikkah" in Arabic. The marriage between a man and a woman is considered as a sacred contract. The Quran verses that describe marriage in Islam can be found in Surah 4 (An-Nisa, Women). However, the sacred marriage contract is not irrevocable as in Catholicism - divorce is permitted in Islam. 1) Mutual agreement (Ijab-O-Qubul) by the bride and the groom. 2) Two adult and sane witnesses. 3) Mahr (marriage-gift or dowry) to be paid by the groom to the bride either immediately (muajjal) or deferred (muakhkhar), or a combination of both. 1) Legal guardian (wakeel) representing the bride. 2) Written marriage contract ("Aqd-Nikah) signed by the bride and the groom and witnesses by two adult and sane witnesses. 3) Qadi (State appointed Muslim judge) or Ma'zoon (a responsible person officiating the marriage ceremony). 4) Khutba-tun-Nikah to solemnize the marriage. Both parties mutually agree and enter into a marriage contract. Both bride and groom have the liberty to define various terms and conditions of their liking and make them a part of this contract. At the wedding, which can take place pretty much anywhere, the bride and groom are separated in different rooms. They may or may not be able to see each other, depending on how conservative the families are. An officiant he asks the spouses-to-be if they consent to the marriage and if they are marrying of their own free will (a representative called a wali, usually the bride's father, answers the officiant's questions on the bride's behalf). This is equivalent of the father of the bride walking the bride down the aisle, and giving away his daughter, in Western cultures. The couple signs the marriage contract or license, with witnesses observing. The officiant brings the pair together and pronounces them husband and wife. 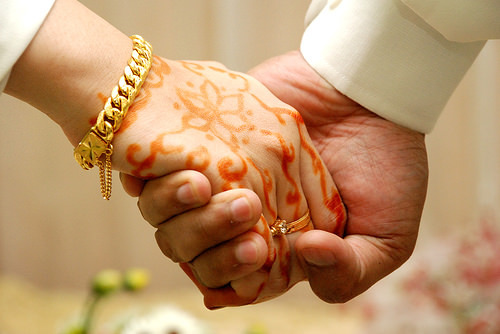 The marriage-gift (Mahr) is a divine injunction. 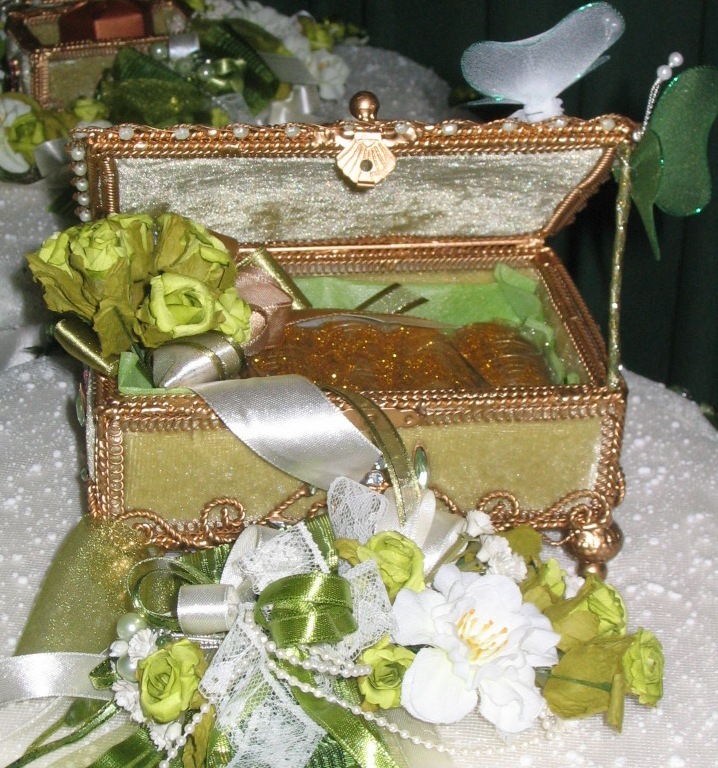 The giving of mahr to the bride by the groom is an essential part of the contract. Mahr is a token commitment of the husband's responsibility and may be paid in cash, property or movable objects to the bride herself. The amount of mahr is not legally specified, however, moderation according to the existing social norm is recommended. The mahr may be paid immediately to the bride at the time of marriage, or deferred to a later date, or a combination of both. The deferred mahr however, falls due in case of death or divorce. The assembly of nikah is addressed with a marriage sermon (khutba-tun-nikah) by the Muslim officiating the marriage. Usually the Qadi (state appointed Muslim judge) does this, but any trust worthy practicing Muslim can conduct the nikah ceremony, as Islam does not advocate priesthood. Prophet Muhammad (S) made it his tradition (sunnah) to have marriage sermon delivered in the assembly to solemnize the marriage. The sermon invites the bride and the groom, as well as the participating guests in the assembly to a life of piety, mutual love, kindness, and social responsibility. The Khutbah-tun-Nikah begins with the praise of Allah. His help and guidance is sought. The Muslim confession of faith that 'There is none worthy of worship except Allah and Muhammad is His servant and messenger" is declared. The three Quranic verses (Quran 4:1, 3:102, 33:70-71). Marriage (nikah) is considered as an act of worship (ibadah). It is virtuous to conduct it in a Mosque keeping the ceremony simple. 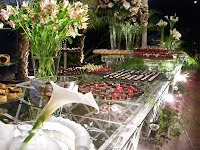 The marriage ceremony is a social as well as a religious activity. Islam advocates simplicity in ceremonies and celebrations. 'The best wedding is that upon which the least trouble and expense is bestowed". (Mishkat). The groom holds a banquet called a walima. The relatives, neighbors, and friends are invited in order to make them aware of the marriage. The Best Way I Know to Get a Honeymoon Trip, Even When Your Budget Doesn't Allow It.